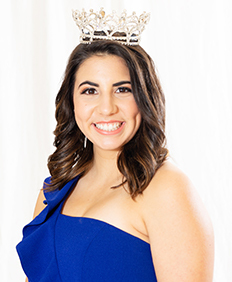 Caitlin Garcia was selected as Miss Teen of Texas in February of 2018. She competed at the National Pageant in Orlando, Florida this past November, and was crowned the 2019 Miss Teen of America. Caitlin is a freshman at Texas A&M University, where she is majoring in Communications and Minoring in Business. She is looking forward to earning her Aggie ring in 2020, which is something she hold to be very valuable. She plans to graduate distinguished by May of 2022. Caitlin is driven to becoming a Surgical Device Sales Representative and a top salesman in her field at that. This desire was created by her passions in International medical and ministry missions and her background of interpersonal communications and public speaking. She plans to take on more leadership positions throughout her college experience, as active leadership has always played a constant role in her life. At Texas A&M University, Caitlin is involved in the Brazos County Young Life, Declaration Church, and Aggie Miracle. She is often is found volunteering with Elder Aid, assisting the elderly and poor housing conditions around the Bryan- College Station area. Caitlin has created a non-profit project called “Wondering Eyes”, where she is collecting gently used or “laying around” glasses and other vision correcting and protective lenses, and providing these materials to those who are in a location where glasses are not at dispense or at an affordable price. She is partnering with Servants Hearts ministries in Antigua, Guatemala, where the vision correcting material is sent to be dispersed as need among the community of Santa Maria de Jesus and San Cristobal El Alto, Guatemala. Her vision for this future to be non- profit business, is that no man, woman, or child has to wonder what God’s creation physically looks like on a clear spectrum, yet is able to see and wonder of His goodness. Caitlin is beyond thankful for American Pageants, the opportunities that have been presented, and what this organization stands for. She is proud to represent this national pageant organization as the 2019 Miss Teen of America.